The title of Hero to the Mongolian People's Republic was created in 1941 by decree of the Khural (Parliament). The order that came with the title is something that isn't in many reference books. Thanks to Yuri, we have a scan of this rare order. The first ten people to receive the title of Hero of the MPR received this award. Order is 35mm in diameter with the symbol of Mongolia or Soyombo on the obverse. Recipients include the first woman cosmonaut V. Tereshkova of the USSR and the First Secretary of the Mongolian Communists Tsedenbal. The Order of Suche Bator was often awarded to officials of foreign countries. Type 1 has a screwback reverse. Type 2 has a clip fastener instead of the screwpost base. All are the same order but through history the name and the design changed. If the order was bestowed to an individual more than once the award would have a shield with the number 2,3,etc. Order of the Red Banner of Military Valor #4!!!! As with the military version above, these are all the same order but through history the name and design changed. The order was bestowed for labor and civil services to Mongolian workers, arats (shepherds), and civil institutions. 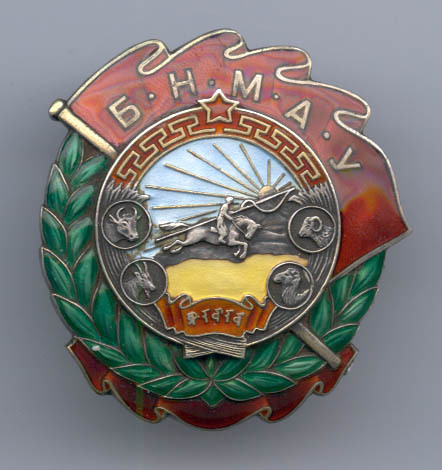 Order of Civil Valor is one of the most faked of the Mongolian orders. Oddly enough some of the better fakes have made their way into the reference books as different variations. Buyer beware! The Polar Star was given for both civil and military services. The second and third types are almost identical except for the alphabet used on the banner. The official alphabet changed in 1940 to the Cyrillic style. The First class order was bestowed to Mongolian women for giving birth to and rearing more than 8 children. The Second class order was bestowed to Mongolian woman for giving birth to and rearing 5 to 8 children.